Delivering the smile in the last mile is a claim we’re proud to live up to. But the last mile is the trickiest part of the e-commerce journey to get right and is also the area consumers judge sellers most harshly on. That’s why it’s not surprising to see logistics R&D so deeply focused on the subject. Between car trunk delivery, self-driving vehicles, autonomous vehicles, robots and mobile delivery solutions, it seems new innovations are popping up every day. The last mile isn’t just complex in terms of logistics and fulfillment, it’s also the most costly part of the entire process. Software company Telogis estimates that it accounts for approximately 28% of the total end-to-end cost of delivery. Customers don’t want to pay extra for their delivery and they have very high expectations. According to a report by consulting firm McKinsey, the variety of delivery options offered and the perceived quality of the delivery service are major decision-making criteria for online customers. Sellers know this and are looking for partners with an innovative mindset and creative solutions to help deliver it. So the question is, how does one offer excellent delivery and at the same time reduce the cost? The answer lies in innovation and automation. McKinsey predicts that by 2025, automation will be a big part of the last-mile delivery process for nearly 80% of parcels. We’re already seeing the start of this. The advent of the parcel locker was just the first step. Then came the drones. 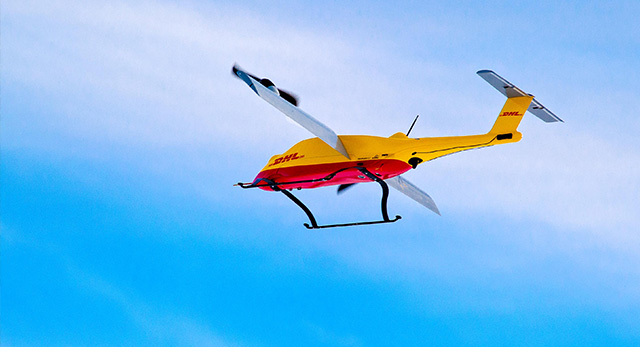 DHL’s “Parcelcopter” started out delivering medical supplies to an island in northern Germany. More recently the DHL Parcelcopter completed an exciting test in the Bavarian Alps, where it airlifted packages to a Parcelcopter Skyport that looked like something out of a James Bond film! Drones have caught on fast—Walmart, Amazon, Alibaba, 7-Eleven and others have all tested them over the past few years. Last-mile technology is advancing on the ground, too. Tests of so-called robotic delivery vehicles are currently underway in California and Washington D.C. Starship Technologies’ small fleet of robots is set to revolutionize last-mile delivery, with cost savings of up to 40%. Our DHL innovation team is also examining how robotics and automation could transform supply chains and change the world of logistics in the last mile. Uber and Ford also announced plans to launch driver-less parcel delivery vehicles last year, and DHL is testing autonomous self-driving vehicle prototypes that work alongside couriers. Another idea is to create mobile parcel lockers on autonomous vehicles that alert customers of their location via smartphone. Already up and running and on the road is Deutsche Post DHL Group’s StreetScooter. This last-mile success story saw 2,000 production units of the small cube van roll off assembly lines in 2016. Powered by 30 kW asynchronous electric motors fed by lithium-ion battery packs, these e-vans will have an in-service range of 50 to 80 km between charges. Deutsche Post DHL Group plans to eventually replace all its conventional vehicles with electric vans. There are also innovations taking place right on the doorstep. Our Parcelbox allows users to install a personal locker at their front door to ensure parcels can be delivered even when they’re out of the house, and it’s already available in Germany. In the future, temperature-controlled smart lockers could eventually replace traditional mailboxes completely. There’s also a lot of innovation taking place behind the scenes. Big data, data mining and modeling software have brought in a veritable gold mine of information. Vehicle movement data and product sales can easily be utilized to optimize delivery routes. DHL developed its own “Parcel Volume Prediction” model which plans parcel volumes by factoring in the correlating data. These big data models help to both optimize processes and improve customer service. And then there are game-changing technologies like the Hyperloop. OK, it’s not strictly last-mile, but the ability to go from Vienna to Budapest in 10 minutes will revolutionize the movement of both people and products. I’m proud to say that DHL is the official logistics partner of the Delft Hyperloop Team and I’m very excited to see what the future holds for e-commerce when this technology comes online. With all this innovation happening right now, sellers should find it easier—and more cost-effective!—to meet the demands of customers. And this really is only the beginning. The pace of change is not going to slow; if anything, it’s going to accelerate. Maintaining the “smile in the last mile” will require continued and consistent innovation and a willingness to embrace new technologies as fast as they become available.